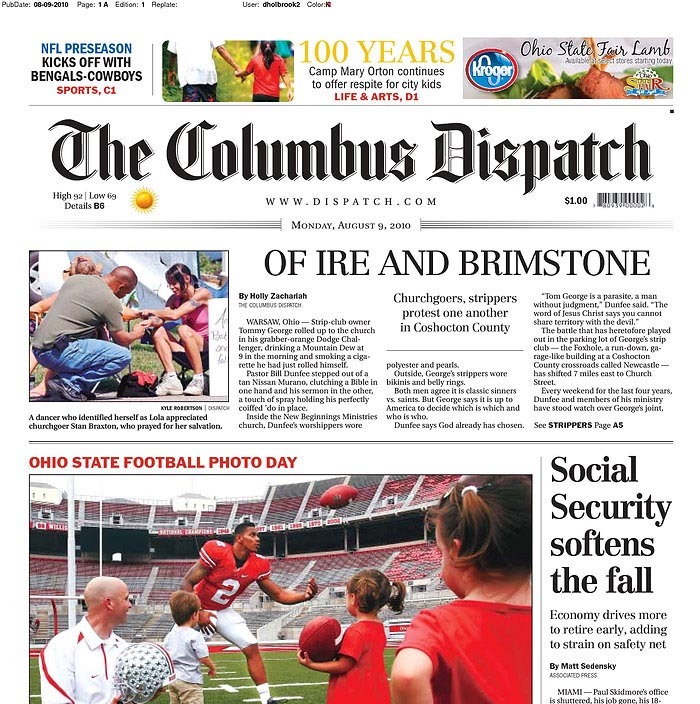 Readers of The Columbus Dispatch woke up Monday to strippers -- above the fold on Page A1, no less. Not to worry, though. The strippers spent Sunday at church, so there was actual news value to the story. WARSAW, Ohio -- Strip-club owner Tommy George rolled up to the church in his grabber-orange Dodge Challenger, drinking a Mountain Dew at 9 in the morning and smoking a cigarette he had just rolled himself. Pastor Bill Dunfee stepped out of a tan Nissan Murano, clutching a Bible in one hand and his sermon in the other, a touch of spray holding his perfectly coiffed 'do in place. Inside the New Beginnings Ministries church, Dunfee's worshippers wore polyester and pearls. Outside, George's strippers wore bikinis and belly rings. I love the first paragraph. It provides concrete-specific language that can't be challenged. A grabber-orange Dodge Challenger can't be anything else. Nor can a Mountain Dew or a just-rolled cigarette. I'm not as head over heels about the second paragraph. Is the pastor really "clutching" a Bible? Or would "holding" or "carrying" be a better word? I have no way of knowing because I wasn't there. Similarly, the description of "a touch of spray holding his perfectly coiffed 'do in place" contains just a bit too much opinion for my tastes. "Take a look at the photos (with the story) -- the congregation seems to look pretty average to me, certainly not some 'polyester and pearls' fundamentalist stereotype. And I haven't found a photo of the pastor yet, but do you really think -- given the size of this church and the way his congregation is dressed -- that the pastor's hair is really coiffed?" Again, I have no way of knowing because I wasn't there. But the story does resort to cliches in a few places, describing the protest as "a long time coming" and saying the dancers "have turned the table." And, oh yeah, "turnabout is fair play." That's not to say that the reported coiffed hair and polyester clothes are cliches, but I can't help but wonder. There's also a reference to "the fire and brimstone being preached in the tidy church building." But that's the extent of the reporting on the sermon. Whether the reporter actually sat down on a pew and heard a "fire and brimstone" sermon or just assumed that's what was preached, it's impossible to tell based on reading the story. We don't even find out the denominational bent, if any, of the church. (The dancers) sat in front of the church and waved at passing cars but largely ignored the congregation behind them. Likewise, the churchgoers largely ignored the dancers. Except for Stan Braxton. He stopped and held hands with Lola, a 42-year-old dancer who made $200 on her Saturday night shift, and prayed for her salvation. Lola, who wouldn't give her last name, said she was grateful for Braxton's prayers and his time. Am I the only one who would like to hear from Braxton? Why did he stop? What did he say in his prayer? What does he think about the dancers? Does he believe in fire and brimstone for strippers? Am I the only one who would like to hear more from Lola and the women with the Scripture signs? Do they believe in God? Did they grow up attending church? Do they love Jesus? What's the point behind the Bible references? If I'm the reporter -- and the editor -- I eliminate some of the quotes from the blowhard strip-club owner and the (allegedly) coiffed-hair pastor and dig deeper with folks such as Braxton and Lola. Do that and this scintillating report suddenly starts to resemble actual journalism.